Read the four chapters in the book of Ruth. Ruth and barley is the topic of the fifth plant included under Plants and the Promised Land. The book of Ruth described day-to-day life during a period of the Judges when there was peace between Israel and Moab. The book begins with Elimelech, his wife Naomi, and their two sons (Mahlon and Kilion) leaving Bethlehem and moving to Moab because there was a famine in Bethlehem. In Moab Elimelech died and Mahlon and Kilion married Moabite women; Mahlon married Ruth and Kilion married Orphah. After about ten years, Mahlon and Kilion died and Naomi decided to return to Bethlehem. Naomi encouraged both daughters-in-law to return to their Moabite family. Orphah did so; however, because of her love for Naomi, Ruth determined to remain with Naomi. Naomi and Ruth returned to Bethlehem at the time of the spring barley harvest. To have bread, Ruth went to the barley fields and gleaned grain leftover from the harvested fields. Ruth gleaned in fields owned by Boaz, a wealthy kinsman of Elimelech. Aware of Ruth’s loyalty to Naomi, Boaz encouraged Ruth to glean in his fields where she would be safe. Boaz told his men to pull extra sheaves from their bundles for Ruth to pick up. Ruth continued to glean in Boaz’s fields until the barley and wheat harvests were completed and threshing started. Boaz and his men often stayed at the threshing floor during the night. One night Noami instructed Ruth to go to the threshing floor and after Boaz was asleep to lie at his feet. Ruth did as instructed. During the night Boaz woke, found a woman at his feet, and inquired who she was. Ruth identified herself and told Boaz that he was a kinsman-redeemer. Under Levirate law (Deuteronomy 25:5-6) a kinsman-redeemer was the nearest male family member of a woman whose husband died. The kinsman-redeemer had the responsibility of marrying the widow. The couple’s first son took ownership of the dead man’s property; thus, land remained in the clan or tribe. Mahlon’s inheritance needed to be secured by a kinsman marring Ruth. The Bible described Boaz as present while the grain was threshed, even spending the night on the threshing floor (Ruth 3:7). His presence at the threshing floor supports his character as a good steward of his land and crops. Boaz told Ruth that there was a nearer kinsman-redeemer than himself; however, if that man would not meet the responsibilities of a kinsman-redeemer to Ruth, he would do so. Early the next morning Boaz sent Ruth away with a gift of a large quantity of barley. That same day Boaz asked the next-of-kin if he would redeem Elimelech’s land and marry Mahlon’s widow. The man declined saying that acting as kinsman-redeemer to Ruth might endanger his own estate. The role of Ruth’s kinsman-redeemer transferred to Boaz. Boaz married Ruth who conceived and gave birth to a son named Obed. Ruth was the great grandmother of King David and an ancestor of Christ (Matthew 1:1 – 16). Barley was a sustaining food source from earliest times. Accepted theory is that barley was domesticated in the Fertile Crescent which encompassed Canaan and the Promised Land. The earliest remains of wild barley (Hordeum spontaneum) were discovered in Iran and Syria around 8000 B.C. Domesticated barley, Hordeum vulgare, has six rows of kernels per spike and dates from 7000 – 6000 B.C. Barley is a small grain cereal used for human food, livestock feed, and malting into alcohol. For Hebrews, barley was a food staple for several reasons. First, barley was less expensive to purchase than wheat (II Kings 7:1). Second, barley was drought resistant and tolerant of both alkaline and saline soils; therefore, could grow in the diverse habitats of the Promised Land. 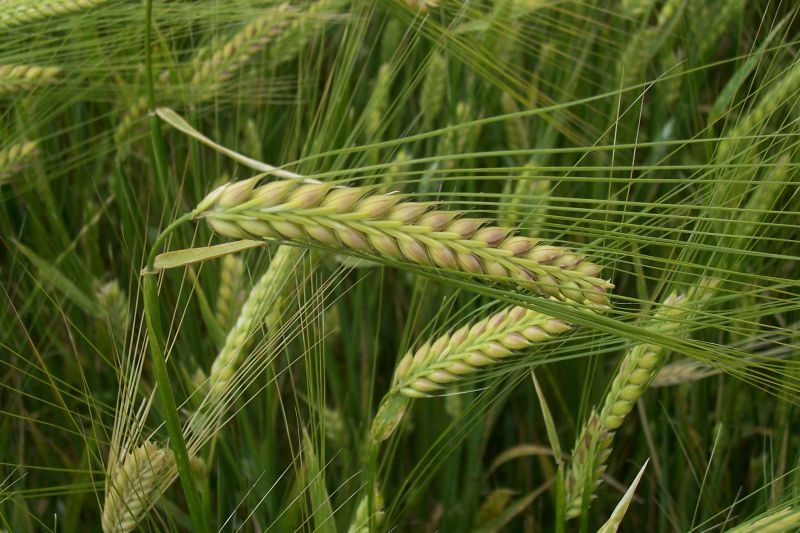 Third, normally barley took 90 – 120 days to ripen; however, it could ripen in as few as 60 – 70 days. Barley is mentioned repeatedly as a food source in Israel; barley bread and cereal were primary foods of poor Israelites. The Midianites referred to Israelites as “cakes of barley” (Judges 7:13), a scornful term because barley was considered an inferior grain when compared to wheat. Even today Arabs use the term “cakes of barley” in reference to Israelites. Barley is synonymous with first fruits. In ancient Israel, God’s annual Feasts revolved around the harvest cycle. The Passover and Feast of Unleavened Bread occurred near the barley harvest in Abib, the first month of the Hebrew calendar. Israelites were required to present a sheaf of the first grain harvested to their priest. The priest waved the barley sheaf before God, a wave offering thanking God for providing the harvest (Leviticus 23:4 –14). The field that produced the first green barley ears provided the wave sheaf. Once the wave sheaf was offered, barley harvesting could begin elsewhere in the community. Both Israel and Christians are God’s first fruits. Jeremiah (2:3) recorded God as saying that Israel was the first fruits of His harvest. In the New Testament, Christ who rose from the dead was identified as the first fruit of those who are asleep (I Corinthians 15:20). Christians have the first fruits of the Holy Spirit living in them (Romans 8:23). At the final resurrection, Christians’ bodies will be redeemed by Christ and raised just as Christ’s body rose from the grave (I Thessalonians 4:13-18). Israelites demonstrated their thanks for the harvest by giving first fruits to God. In the same way Christians are called to give the first fruits of their labors to God. I have heard that giving the first fruits of our labors to God is an Old Testament commandment not relevant to Christians living under grace. Yet, Christ himself lived under the law and said that he came to fulfill the law not abolish it (Matthew 5:17). Surely, first fruit sacrifices that the Israelites made under the law should be matched, or even exceeded, by Christians who live under grace. I find it easy to give the first fruits of my money to God. I have a lot more trouble giving the first fruits of my time to God. I have so many things to do with my time; e.g., part time job, husband, house and garden. These activities do not sound all that time consuming when compared to demands of working women with children; yet, my days are filled. I have to consciously schedule church activities on my calendar. I need to agree with God that he deserves my time as much as He deserves my money. Reflection: With all his wealth, God does not need anything from us. God’s commandment to give Him our first fruits (time, talent and treasury) was designed so that He can shower blessings on us (Malachi 3:10). Are you giving the first fruits of your life to God? Copyright: June 16, 2011, Carolyn A. Roth; all rights reserved. This entry was posted in Plants & the Promised Land and tagged Barley, Bible, Bible Gardens, Bible Plants, Bible Study, Boaz, Canaan, Christian walk, christianity, First fruits, Garden, Gardeners, God, God as a Gardener, Hordeum spontaneum, Hordeum vulgare, Israelites, Plant, Promised Land, Ruth, spirituality. Bookmark the permalink.